I’m really excited to welcome our very first guest on the Boss Mom Podcast. Now, Adria DeCorte is a healthy living strategist, and she helps female entrepreneurs, like all of those listening, make healthy living part of their business. And, I have her on as the very first interview or conversation that we have on the Boss Mom Podcast, because I think that there are so many of us that put our family and our business at the front of our priorities, and we don’t take care of ourselves. So before we can really get into all of the ways to save time and create better focus, and grow your business and grow your family, lets talk about us for a minute. Let’s talk about how we make ourselves healthy, and by doing that we are also be able to help make our business and family healthier as well. So, she actually did an amazing Tedx Las Vegas talk recently called “How Food Fuels Hustle,” and it calls out a quite but really damaging epidemic where think we’re “too busy” to eat a proper meal. And, really invites us to shift our thinking to food and self-care as fuel for the work that you want to do in the world, which is so important. It’s so true, when you take care of yourself and think of it as fuel, then you know that fuel is helping to move forward your business and family. She has a Master’s of Science with six years experience as a plant scientist, which just alone is pretty cool, and hosts the Future Hustle Podcast, which you definitely have to check out. We’ll have it in the show notes, where she gets real about the self-care balancing act behind the scenes of your business, and provides actionable guidance, which is what I love, I love actionable guidance, for simplifying kitchen time so you can really eat meals that fuel hustle and have the energy to change the world all at the same time. And, so, without further ado I would like to welcome Adria DeCorte and let’s jump right in. Dana: And, welcome to the show. Adria: Thank you Dana. Thank you so much for having me. I know we’re going to have a blast today talking. Dana: I’d love to hear a little bit about your story, how you got into nutrition, your road into this brand and this idea. You know, how did it come to you, tell us a little about that. Adria: Ok, woo, diving back into the way back machine. So, I just want to start by just saying a little while back that I found an old photo album, and I was looking at some pictures of myself, and it was from my early 20s and I was resting my hip against the hood of a cherry red Toyota Corolla and the background were all this wilderness, all green shrubs, red mountains, blue skies and then there was me, and I was slumped against the hood of the Corolla, and I looked tired and drained. And, when I looked at those pictures, it really shocked me, because those memories in my mind were some of the happiest I had. And I remembered it being an adventurous trip, and I was with my husband. We had went down a side road just to see where it went, and I remember feeling super energetic and alive, but I saw the photos, and they said completely differently. And, it was a bit of a wake-up call to me that I’ve had a shift in energy over the past decade, and it made me start to think, “What led to that?” Because, now I’m such an energetic person, I can’t not smile in photos, and it’s just a little bit of a disconnect and thinking back at the time, for the first thing I, a lot of the women in my family have a little extra pounds on them, and I had that too, and I always thought that it was my fate. I always thought that, I kind of like a little bit, I hesitate to say, but like of victim mentality around it. A little bit like, this is how I am; my weight is gonna keep going up. This is the way things are, the way I feel, like being sluggish and tired all the time. That, that is just the way I am. I didn’t know that there was any other way. And at the time, my favorite foods were cheese enchiladas and fried egg sandwiches, and these are like what I would call beige foods now, which I know makes me feel tired and heavy. But, at the time I wasn’t really making that connection that what I was eating was actually contributing to the way that I was feeling, and I didn’t really even realize I was missing energy. I didn’t know what I was missing. So, the turning point came one day when I stepped on the scale, and I discovered that I was the same weight as my husband, who happens to be 6’2,” and it was a little bit of a shift in my brain like, “Oh, woah, woah, woah, I haven’t been this heavy before. I think I need to do something.” And, it’s not really the weight that’s the issue, but at that point, it’s what was necessary to make me make some changes in my life, so it’s part of my story. And, that’s what followed was my nutrition education. I’m type A like a lot of us are in terms of when I want to learn something and implement something in my life, I go all out. So..
Adria: So, I started the nutrition education. I started to learn how to really nourish my body, started eating way more vegetables, way more color in my diet, and I started to notice that gradually I was going for more and more opportunities. That, first, I applied for and secured a major promotion at work, and then I had that oomph to follow my dreams and go into business for myself. So, even though the pounds were falling off at that point, it was so much more about me getting this new energy. This “hustle” is what I like to call it. I’m reclaiming the word hustle. A hustle, like the energy to do the things I want to do in the world, to have the impact I want to have in the world. And, this was really huge for me, but at the same time I mentioned being a driven woman. I took it kind of too the max. I was always perfecting my diet, always going down the rabbit hole of “what’s a cleaner diet?” “What’s more things I can do?” “How can I perfect my body more?” “How can I exercise harder?” And, it was to the point that I was working out seven intense hours each week, and I ate a strict raw food diet, and I was at the lowest weight I had been. I was at my fittest body ever, but I was holding myself to such a strict standard, that it really actually kept me more dissatisfied with my body, with what I was doing, with the food I was eating, with whatever it was, and I was really unable to enjoy it until I had this “ah-ha” moment that I had really forgotten why I was doing it in the first place, which was really just to be happy. I mean, I think all of us; our real goal in life is to be happy, right? Adria: And, that moment I realized that happiness is really found in balance and not in perfection. And, it’s in that point somewhere between being a victim and being a perfectionist. Dana: Oh, I love that. Adria: Some space in the middle, yeah. Adria: And, that I infuse into everything I do now. My work with clients, what I talk about on the podcast, because I want other women who have the same issues as me, which I’m sure are many of your listeners, we’re all very driven as entrepreneurs, and working for ourselves. I want them to realize that that is a safe space in the middle, that you don’t have to go and be a perfectionist with everything, but you can take control, and you can start to notice how things make you feel, and make conscious decisions without going crazy and having to follow rules. Dana: kind of not, if don’t pay attention to that it’s actually doing the opposite of what we wanted. So, I love that you mentioned that, because it’s not just about eating healthy. You know? It really does have this complete effect. Like, when I’m pregnant, I totally urge having mac’n’cheese. I want it so bad, but I know that if I have it, especially at lunch time, I’m going to have to take a nap. There is just no way to avoid not wanting, to not even be able to keep your eyes open afterwards. So, what’s the point? You know? Then you’ve lost like three hours of your day. Adria: Well, and, and also, sometimes feeding your hustle is making the conscious decision, “Hey; I want to have the mac’n’cheese, cause it’s good for my soul,” but making the connection that I’m not going to have the mac’n’cheese before I go and have a big client meeting or do a big speaking engagement or something you know. Dana: Yeah, well, it’s funny though, because I’ll do that. I’ll, sometimes I’ll buckle and I’ll have mac’n’cheese, and then the other day for breakfast I opted to, we went out for breakfast and I opted to not have, you know; the big man hole sized pancake that they have here at this breakfast place. It’s seriously the size of a man hole. I was like, “Nah. I’m going to get the Greek yogurt with the fruit and the granola.” And I was like this tastes so much better and, then I was like let’s go. I’m ready for the day. To whereas, I would have wanted to take a nap afterwards, so it’s like it actually tasted better once I had it. It’s just the pancake sounded better. It’s funny how it sounds better, but the other ones end up tasting better. Adria: Yes. Yeah, being in touch with how things are going to make you feel is such a huge revelation. It’s kind of like being connected to your body, being grounded in yourself, and experiencing your life in the present. You know? And it’s funny, with women who are in business. We have this tendency to be so busy, to be so caught up in everything, that, like you said, we don’t take a moment to think about, “How’s it going to make me feel?” And to think about the food as a component of our business day, and not just, “Oh, I gotta eat this and keep going,” but exactly what you said. And, it’s funny, because even with healthy habits across the board, when I was working 40-hour weeks as a government employee, it was pretty easy to fit in those daily workouts and the “clean eating,” but when I took that leap and transitioned to working as an entrepreneur, those same healthy habits were really hard to hold on to. And, you know, my grip. My daily workouts gradually fell away, and I was lucky to get maybe two a week. My meals became a dash to the kitchen, and my morning routine was falling in bed and grabbing my laptop to start work. Dana: Yeah, I love that. Adria: And, that is why I do. Dana: No, I love that, because you’re absolutely right. Add in being a mom to that and you just basically, you become last, but I’ve realized now being a parent that the example that I set for that, that the more my son sees me eat healthy, that when he sees me eat it; he eats it, and so, you know. I would try to feed him healthy things and then run over and make myself something really quick, because we didn’t have time. But, when we all sit down together, and we’re eating the same things, all of a sudden, he’s eating Brussels Sprouts, and all of a sudden he’s eating, you know, things that he wouldn’t before, because we’re eating them and he’s seeing that we think it tastes good. So, he wants to try it, and he’s more open to that. So, before it was this trying to just get things that he would eat and hurry up and realizing and taking that moment and set the example, and that I’m not only eating healthier, because he drives that from me, because I don’t want him growing up only eating fast food as the food you eat. Or, you just eat whatever you can on the run to understand, like you said, what it does for your energy. So, yeah, I love that, because you have to give yourself that time, or otherwise, you get exhausted. Adria: That’s awesome. Leading by example actually works. Dana: I know. Wonderful, so one of the things I wanted to talk about is one thing that you, is big for what you teach, is really simplifying kitchen time. I love that, because as busy entrepreneurs, women, a lot of listeners are mothers as well, we don’t have a lot of time in the kitchen, and also, you know, sometimes like for me when my son comes home. I don’t have an hour and a half to cook dinner, because he’s like I see you in the kitchen, and I know what that means so, that means I’m thinking about food now. So, I have a limited amount of time before he gets in his chair and starts pounding the table with is fork and spoon. So, I would love to tell our listeners some tips about so how do you simplify kitchen time. What does that look like? And, how can they access that idea to really help them to eat healthier. Dana: Yes. Funny how that works. Adria: Right? Funny how. So, the first thing that I tell clients, that I tell people, is to start with just making it so when you open your fridge you have possibilities. That, when you open your fridge, you look inside, and it feels easy. You, maybe, have some things prepared in advance, so on the weekend on a Sunday or something, you’re making a batch of beans or grains or whatever it is that you like to have during the week that you can just pull out and toss together and make something. Maybe you chop some veggies in advance. Whatever that means to you, that you have some things prepared in advanced that are easy to pull out. All so that you keep a stocked fridge in terms of if you want to eat more salads, then making sure you have plenty of salad greens right. If you want to have green smoothies, making sure you have the ingredients for that. And, everything, so that when you open the fridge doors, and you look inside you see the ingredients as possibilities for meals. So, maybe you put things in certain zones. So the ingredients for your green smoothie are in one section of the fridge, the ingredients you might use to make a salad are in another section, or something like that. That it makes it so that you feel ease around opening that fridge and finding something to eat. So, that’s one huge thing. The second thing is to think about your meals as meal templates, where maybe you want to make the same type of meal each day for each meal. So, all breakfasts are green smoothies, and all lunches are salads, all dinners are, in my case, I like to do a bowl that has some type of beans, some type of gluten-free grain, and some type of cooked veggie with some kind of delicious sauce. So, whatever it is, so that you always know that for breakfast, I’m making a green smoothie, for lunch I’m making a salad, or whatever it is, and then the ingredients seasonally, the ingredients change based on what you felt like grabbing when you were at the grocery store, based on what was available. So, it’s always variety, it’s always being mixed up, but it takes a little bit of that thought away when you go to make something that you can instantly get into action making it rather than trying to figure out what you’re going to eat. Dana: Mmhm. Oh, I love that. Yeah, the fridge one, I know that when I joined your email list, so I could get my free breakfast plan, which everybody should do, and we’ll have that in the show notes, that was one of the things you talked about was the seeing the opportunity in your fridge. So, the next day I cleaned my fridge out, threw away the things that were leftovers that I was never going to eat anyways. And, did that, I categorized by like snacks vs meals, and I got a little white board and for the week, I was like, “ok here’s what I’m going to make for dinner,” so I didn’t have to think about it. And, it’s definitely made it a huge difference to go along with that plan, and then I was able to see gaps and go, “wow, wait a second. I don’t have anything for lunches, for like most of the week. I should probably think about that.” To whereas, I wouldn’t have done that, and all of a sudden I go to the fridge, and I don’t see anything and I end up either not eating, or eating something that isn’t healthy at all, or is some random snack for my son, that I would give my son to go to school because I just hadn’t planned for it. So, I love that actually organizing my fridge has really helped a lot I think. Adria: Yeah. Well, it’s funny, because the number-one challenge that I see with the entrepreneurs that I work with, moms and non-moms included, across the board really is more lunch. Yeah, it’s lunch where we get so busy during the day where we just keep powering through and either will end up skipping lunch and maybe around 2 p.m. where we hit this hunger point, and we’re like ok and we have to go and grab whatever is possible to grab the easiest thing to grab, or maybe we grab takeout or whatever it is. And, then that leads to maybe a 3 o’clock slump, well it’s 2 o’clock, so maybe a 4 o’clock slump, and then we have a couple of cups of coffee, or whatever it is, right. Adria: Or, or there’s the people who are just grazing throughout the day and but they never actually end up feeling nourished. So, they’re at kind of like this lower power level all day, because they never actually had a full meal that had like all the nutrients and nutrition and really energy and calories that they would need to keep moving. Dana: Right, right. Absolutely. I know that when I was in corporate America, I used to keep a bag of pretzels with me, and I would be amazed at how, because I would be so busy going from meeting, to meeting, to meeting, to meeting, and I would just graze on these pretzels. So, I’m getting all this sodium I don’t need, and nothing that’s real about what I’m actually eating, and I would do that all the time. Yeah, and then I wondered why I was exhausted, and the only reason I felt like I thought I had energy was because I was so overrun that I was almost over exhausted that I didn’t notice it, but the second I would sit down all of a sudden I would be like, “oh my gosh. I’m exhausted, and I haven’t eaten anything good.” So, yeah. You know. It’s funny, because even just being an entrepreneur, your right, has changed my schedule and my terms of the time of day. You know. I don’t have the, I guess, the routine that I had when I was in corporate America, but I find I have a lot more flexibility that I, you know; I work at home, so instead of trying to bring things to work all the time I’m able to have things in my kitchen and organize that the way I want. So, in some ways it’s helpful for the being healthy. It just ruins the routine aspects, because you don’t have, because I guess as an entrepreneur, your day just changes so much, unlike when you were in corporate American. Dana: So, I also wanted to talk about, often times the Boss Moms, or the women in this community, we get tired, and I know we’ve talked about that a little bit, and it’s not always just because of food. It’s because we are running around doing, trying to take over the world, and so, you know; what kind of meals or techniques could we use to really help us keep up the energy. Like, what kinds of food aren’t just the kind that are the kind your body needs, but the kind that will actually help you wake up and give you that little pep without it being coffee. Adria: Ok! Yeah, so, I would say, first of all, just making sure that you actually make sure that you do have some food in your body is the first step to feeding your hustle and getting your energy up, and then also eating lower glycemic foods with some staying power. If we’re talking about during the day, like you were talking about the pretzels before, my go-to snack is raw almonds, maybe an apple. Just kind of really simple things that don’t really require refrigeration, that doesn’t require, I mean they’re very portable/packable, but just in general, whole foods are more nutrient dense, and they’re easier to digest. Which, gives you more of the energy left over to spend on making an impact. So, that’s kind of an important key to think about. Our bodies’ kind of recognize things that are actually in their natural state, things that maybe you go to the grocery store, and you don’t find them in a package. So, during the day, what I recommend is to have meals that are a combination of like energetic veggies and grounding steady energy from low glycemic carbs and protein. So, a breakfast that I would typically have either, I kind of alternate between having a green smoothie or having steel cut oats and a side of steamed greens, so something that kind of includes the green component, but also includes a nice energy, like grounding stable energy steady component. Adria: I’m sorry, go ahead. Dana: Cause it’s not like they say on the back of it, you know; I’m low glycemic. Adria: and buckwheat, but just things that are closer to being a whole food or actually are a whole food are going to be lower glycemic. Like, when you strip out things, you strip out the fiber, you strip out the fiber; you strip out all the stuff it came with when it was grown, when it was born by processing it, by putting it into a packaged food or even making it to even something made with flour or whatever. You’re changing it. Even if a flour product is made with whole grains, but the process of milling it and making it fine and powdery, you’re changing the glycemic index. So, it’s just not making it complicated on yourself, but just getting it back to as whole as you can eat, as whole and close to nature as you can eat, and I recommend if you’re going to have what we call “carbs”–which everything has carbs in it– but I would recommend more of the whole grain, or the beans and legumes. Dana: My mom is always yelling at me that I should eat more lentils. Adria: Yes! Oh my gosh, I am such a lentil phene. Lentils are an amazing food, because not only are they an amazing protein source, they are easier to digest than beans. They are also (if you get red lentils) they cook so fast because they’re split, so you can cook them in like five minutes. Like, no joke. And, even just whole green lentils or the typical lentil you think of, they don’t need to be soaked like beans do. You can just cook them directly. You just rinse them really well first, and they have such good staying power. They’re a little bit, like I said, they’re easier to digest than beans. Yeah, I feel like that should have it’s place in most people’s pantries. Just having some lentils in there. Dana: and it makes them creamy. Dana: It’s like a good alternate to, alternative if you’re putting dairy in or something like that, but I put lentils in and it gives it that creamy texture and feel to them. So, if anybody is like me and you’re like, “eh, I’m not really sure I like lentils.” The other thing you just made me think of is I, part of, when I go into a regular grocery and I’ll see all these grains and they’re expensive for all these grains, but if you go into a Whole Foods store they have the bins, so you can get a small amount and test it out. So, if you’re nervous to put your foot in the water in terms of trying the grains, like the fun ones you mentioned. I got just like a little handful of different ones to make them to test them out to see which ones I liked and would work for me and everything without having to jump into a big bag at the grocery store, so that’s my contribution to the grains conversation. Dana: Yeah. Absolutely, also I love the, so as I’m thinking, this term lower glycemic it just seems intimidating to me. Dana: But, basically when you’re saying, you know, the food that’s most in its natural state, and I had a friend who basically had this policy that if it doesn’t mold in three days, she’s like I question whether or not I should be eating it. Dana: And, I’m like gosh, well that throws my love for donuts out the window. But you know, besides almonds and things that obviously don’t do that, but that idea that the less ingredients there are; people ask me and see me reading ingredients in the store, and they’re like, “well, how do you know what to get?” I was like, “well, if I can’t pronounce everything on the back of the ingredients, then I don’t get it. I try not to buy it. Adria: So, then I’m like, “Ah, well.” I take it with a, I have a little bit of hesitancy, and I think seriously about it, but also you know, with all of this nutrition education. I mean getting back to what I said at the beginning about not being a perfectionist also, and you know, if you don’t do something perfect sometimes, hey, it’s ok. It’s healthier for your in the long run if you don’t get stressed over making the perfect choices with food. Dana: Yeah, absolutely. And, I wanted to jump in cause this is something that a lot of people have asked when I let them know I was going to be interviewing you, and that was that they’re often on the road, traveling for business, or they just get up and didn’t realize that that day they were going to be at meetings all day, and they didn’t plan ahead to bring anything from home. They find themselves on the road, and now they’re not sure what to do; I’m hungry. Dana: How do I fit healthy eating into my schedule when I’m not in front of my own fridge? Adria: Yes. Ok, so the first thing that I would say is, obviously, once you’re already in this place you can’t do this, but to start now by preparing in advance, just like, have some almonds in your purse at all the time. Because, they keep, they can just stay there for a long time, and then when you get to this point you can be like, “oh” and discover them in there and you’re like, “Ah, perfect! I can go a little bit longer, have a little bit food,” because they’re a little slow release package of fat, and fiber, and protein and nutrients and everything. So, that’s my first thing, is to kind of prepare right now for that moment that is going to happen and then when it does happen if you’re caught in that place, and you’re like, “Ok, I need something right now.” If you have a grocery store near by you can, pop inside and grab an apple or a juice or a smoothie. You can do the same thing going to Starbucks. If there’s just something near by that you can pop inside and grab something that’s going to make you feel good and hold you over a little bit longer that’s great. And if you’re out, and it’s time to have a meal; it’s time to have lunch, and you’re out and you’re not prepared, then wherever you end up going, say you’re going out with, out on a lunch date with colleagues or whatever, wherever you end up going just choose what’s closest to what you know makes you feel best, and then move on. You know? That’s my big advice. It’s just, on one point be a little bit prepared, because you know it’s going to happen so you always have something, and then you know, when it does happen make the choices, the best choices you can at the moment. Dana: It had like a hard boiled egg, and it had a, you know, some nuts in it and some grapes and a little thing of natural peanut butter. You know, so it was like that was awesome, because it was either get a hamburger somewhere, which was going to be totally exhausting, or go there and be able to get, like you said, a smoothie and this, which he loved all of it, so yeah. Funny, Starbucks is actually, and grocery stores now like Costco here, and they have those pre-made dark, dark-green salads, and its got, the one I get has walnuts and craisins that you just pour on top with some balsamic vinaigrette or something like that, and it’s just; it’s already portioned for you. So, you just buy it, open it and eat it. And, I’m like “Thank you” because making a salad takes time for me. Dana: It’s nice to have it already made, but not be like the light greens, you know, that are just like drinking water and that’s about it. Adria: Yes, if you can find things that are exactly like that, that save you time and just make it simple to grab and go. Surprisingly, you can find things like that, and if you’re on the road, yeah sometimes the best choices are going to be going to like a Trader Joe’s or a grocery store or a, something like that that you would not normally think about going to grab something from. Dana: Yeah, actually Trader Joe’s is great for that. Dana: They’ve got like a whole section of some pre-made things that are really simple and easy. That, yeah, I’m a big fan of Trader Joe’s. So, I was going to ask, you know, as we’re kind of wrapping up and everything, like where can we find you? What do you, I know you just did a Tedx Talk, so you gotta tell us about that for a minute, about your website, your podcast, you’ve got a great blog, you know, tell everybody where they can go out and experience more of you. Adria: Yeah. Ok, so, first of all, I’ll start with the Tedx Talk. It’s called “How Food Fuels Hustle,” and it’s so much of what we talked about today, but even more, at least I like to think, more powerful, and you can go directly to YouTube to look it up, How Food Fuels Hustle, or look up my name Adria DeCorte, or on my website. Dana: Well, we’ll have it in the show notes. Adria: Yeah, exactly, and watch it. An audience member said that it was powerful, that it did provide them a powerful shift in their thinking, and if you do believe in this whole Feed Your Hustle movement we’ve been talking about, please share it so that it can reach other mom bosses who need it. So that’s my first thing, is the Ted Talk, and then my podcast, Feed Your Hustle. That is on iTunes. It’s also at feedyourhustle.com. You can go straight there, or I’m sure we’ll put it in the show notes also. Adria: And, that is a place; you’re already listening to audio, so this will be right up your alley as well. It’s very, like, not similar, but like complimentary to what Dana is talking about on this podcast, and I help you make healthy living a part of your business plan essentially. So, a lot of what I’m doing on the podcast is also talking with other successful female entrepreneurs, many of them are moms too. Because we’re women and, you know, chances are we’re gonna be a mom, but the self-care balancing act that goes on behind the scenes of their business, and this whole concept of starting to take care of ourselves so that we can make a bigger impact. 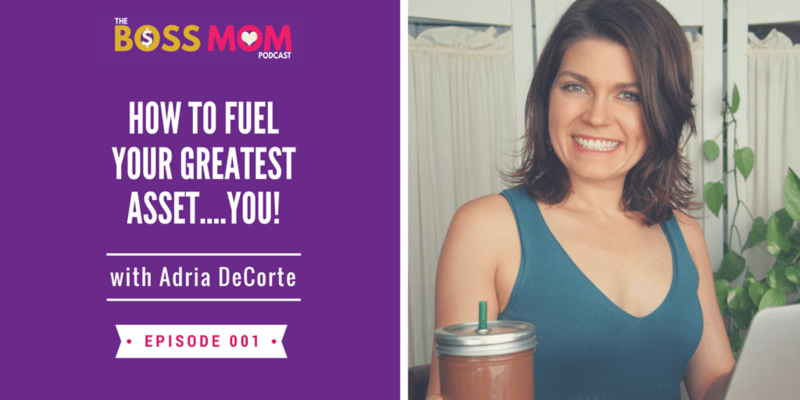 So, that’s my podcast, Feed Your Hustle, and then over at my website adriadecorte.com, that’s where you can get guidance from me for simplifying kitchen time so that you can eat meals that fuel hustle and have the energy to change the world. And, in fact, my opt-in bonus, which Dana alluded to before if you join my list, is the 3-Minute Morning Meal Plan. Which is basically designed as a simple breakfast strategy to super-charge your workweek ahead. So, if you want to go ahead and grab that to get started feeding your hustle during busy mornings, I think that is a wonderful beginning to get started with a lot of the things we talked about today. Dana: Yeah, and you, also, you have a Facebook Group as well, correct? Adria: Yes! I do. I have the Feed Your Hustle Facebook Group, which is all of us female entrepreneurs together talking about our behind-the-scenes challenges, self-care, and how we’re eating well, and kind of providing advice and accountability and a support group where we can actually start to talk about what’s going on behind the scenes of our business. Dana: Yes, and I love it cause it’s great. I’m in the group, and it’s a great place where if you have questions, you know, about getting help; you’re in a situation and you want to make something, and you’re not sure what to do kinds of things. There’re people from all over that are in the group, and it’s a nice active group where you can get sort of that immediate, immediate help. Adria: Yes, we have an, oh it’s an awesome group. We have, like, almost every guest who’s been on the podcast is in there too, and they all have their own areas of expertise, but I’m also in there, and I’m also answering things as they come up. But yeah, someone will ask a question in there and then other people in the group will come in and answer for me and I don’t have to say anything, because we have some awesome people who really know their stuff in there. Dana: Wonderful, and for those that are listening that are just falling madly in love with you, which I’m sure they are. There are many, many of them that are saying I want individualized help, you know, with getting the plan and hearing tips just isn’t going to be enough for me. Do you do sort of individualized coaching or counseling, and how does that work and how can people connect with you in that way if that’s what they’re looking for? Adria: Yes, absolutely. I love to support women in this. It’s like kind of my jam. It’s my passion, and I’m in the process of kind of shifting how I work with people. I’m developing what I’m thinking is going to be a 90-day 1:1 experience where you work with me as your healthy living strategist, and I can help you start to feed your hustle one step at a time by that accountability, that personalized insight into what your schedule looks like, what your business goals are, what your lifestyle goals are, what are your challenges within that whether it be family, or specific things you have going on, and helping to kind of like go through that and start to feed your hustle essentially, right? I can act as both your consultant and your cheerleader at the same time, save you time, boost your energy, integrate the habits that get you grounded in your body and started feeling amazing and powering your business at the same time. Adria: Yes, it is so needed. Dana: Yeah, well, we do one final thing on the show, and that’s a final moment of motivation. So, if you could provide, you know, one bit of advice or inspiration to help listeners end the podcast really feeling energized and ready to, well, fuel their hustle. Adria: Ok, that would be that you are your businesses greatest asset, so treat yourself accordingly and feed your hustle. Dana: and not only that, but not presenting your best self is apparent to your client. So, you’re going to get more of your ideal client, more of the people you want to work with, more of the people that are that cult following that want to run out in the rain and say how amazing you are when you’re putting your best self out there. And, if you’re not feeding your hustle then it’s hard to do that on a consistent basis. So, I love it. Yay, well thank you for being on the show. It’s been awesome. I am so excited for the community to be able to hear all of this, because I know it’s a really important part of you know, our day-to-day lives. I mean we eat every day, so..
Dana: It’s kind of important. Adria: It’s so important, right? We do it every day. It happens over and over. Well, thank you so much for having me on Dana. I seriously had such a good time talking about this, this stuff as I’m sure you can tell gets me so excited and passionate. Dana: Good! That’s when you know you’re in the right spot, is when you can’t talk enough about what you do every day. You know. You’ve found that right purpose and path for yourself. So, good for you. And I can’t wait to see the Tedx Talk, and we’ll have all this fun stuff in the show notes and once again, thanks for being on the show. Dana: Well, that wraps up this episode of the Boss Mom Podcast. We did it. Yay! I am just thrilled that you came to spend time with us today, because I know you’re busy, because all boss moms are, and our time is precious, and I will not take that lightly. So, in every episode we’re going to try and make sure to jam packed with information that really helps you to raise your business and raise your family in a way that is right for you and your life goals. So, I am your host Dana Malstaff, and I cannot wait to see you next week. Oh, and don’t forget to go to boss-mom.com for extra resources, and join our community there of the ever growing Boss Mom Movement. I’ll see you next time.